Plum/apricot cross resulting in a unique blend of flavors. 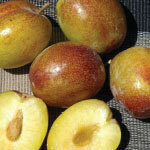 Plumcots have a higher sugar content and a much sweeter flavor than plums or apricots. The fruit has pinkish orange skin with amber marbled flesh. Your plum parfait is freestone, so feel free to give one to the kids for a healthy snack; they shouldn't have to struggle too much with the pit. This plum cot variety blooms early, so you know spring is coming soon when you see the beautiful blossoms from your tree. The plum parfait is a compact small tree which should keep you off of the ladder at least a little, and is also self fertile. 400 chill hours.